Instead of sharing your delicious basil leaves with the insects, keep bugs off basil plants. Several different insects tend to infest basil plants, but an attentive gardener can keep the upper hand and prevent insects from desecrating a basil plant. Whether you have Japanese beetles, aphids or slugs attacking your basil plants, prevent them from destroying your basil so you will have a bountiful basil harvest. Fill the Mason jar two-thirds full of warm water, and add two to three squirts of dishwashing detergent to create soapy water. Pick the Japanese beetles from the basil plants, and drop them directly into the soapy water. Continue removing Japanese beetles every time you find them, and place them into soapy water. Spray insecticidal soap directly onto the basil leaves when you see aphids infesting your basil plants. Spray the leaves in early evening so direct sunlight from daytime sun will not bake the soap into the leaves and damage the basil plants. Check the undersides of the leaves as well, because aphids often cluster in these areas. 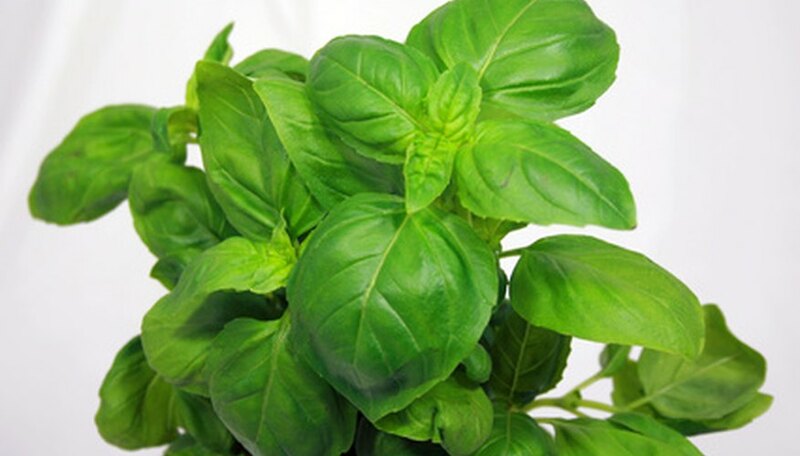 Spray the basil plants with the insecticidal soap as often as necessary to control aphids. Sprinkle diatomaceous earth liberally onto the soil around the basil plants to control slug populations. Because diatomaceous earth is a powder, shake it lightly to dust it over the basil and the soil. Applying the diatomaceous earth in the morning while dew still coats the basil plant will help it stick more readily. Reapply the diatomaceous earth after every rain shower.